Removing Mold - And the Cause of It - Basement Waterproofing, Inc. Basement Waterproofing, Inc.
A friend of mine recently went to look at a house with his fiancee. It was a beautiful little home, in an idyllic, countryside setting. Everything looked great – until they visited the finished basement. Once they got down there, they discovered a huge problem with the home – mold. Water damage, mold and mildew had pretty much destroyed any chance of simply moving in and using the space. My friend told me they decided that it would cost too much to fix, and that they would look elsewhere. Unfortunately, this is a common scenario, and a lot of homes stay on the market longer than they need to because of basement issues. It’s always something you want to be on the lookout for when purchasing a new home. Sometimes, people will go through the motions of having mold removed from their basement when they put it on the market. But, they won’t fix the problem that caused the mold growth in the first place. And, there are a lot of companies that will happily charge for mold removal – knowing they’ll be back to remove it again and again because the water problem remains. If you really want mold removal in your home, you have to get to the root of the problem. 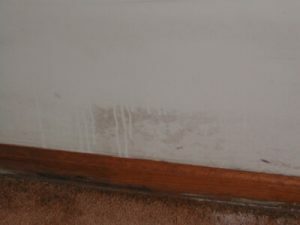 At Basement Waterproofing, Inc., we will provide you with mold removal. But more importantly, before we do that we’ll offer you a solution that will keep your basement dry for good. There are many reasons why mold grows in the basement of your home. In homes where water is an issue, the basement often is the perfect climate for mold. Dark, damp spaces are where mold, mildew and bacteria thrive. So a basement with a moisture problem is usually home to a whole host of pathogens. BWI uses proven methods of basement waterproofing, so wetness is a thing of the past. Once we have solved your basement moisture problem, we will remove any mold, mildew and bacteria from your basement. We use a specially formulated anti-mold spray on the entire surface of your basement after we complete every job. Our commercial spray kills everything up to and including the H1N1 virus. We do mold removal on every job, for every customer. So, if you’re buying a house, make sure you check the basement out first. And, if you’re selling a house that has a basement dampness problem, call BWI to help. We’ll do much more for you than just remove the mold – we’ll make your home more valuable, so you can guarantee your buyers that you’ve had the best basement care available. Not to mention, we offer a lifetime-transferrable warranty which we will honor should your purchaser ever have any basement concerns. We’ll help your home have a better resale value – call us at (800) 439-4951, and we’ll be glad to help.